Tennyson's mother Sadie is gone. Sadie's a high-strung artist, destined to be a famous author, and now she's run off, saying that her family is holding her back. Tennyson's father goes off in search of her and brings Tennyson and her sister Hattie to Aigredoux. Aigredoux. The name means "bittersweet" in French. And Aigredoux is bittersweet. Once an imposing, glamorous mansion, Aigredoux is now falling apart at the seams. Marble once covered all the floors and stairs, but it's slowly being sold off to make ends meet. The house is being torn apart, crumbling before their very eyes. But that won't stop Aunt Henrietta from trying to save it. Life under Aunt Henrietta's roof is much different from the life Tennyson and Hattie had at their old home. They sleep on a scratchy moss-filled bed underneath mosquito netting to prevent ceiling plaster from coating them as it falls during the night. They're expected to learn how to behave like ladies, how to interact with potential suitors... because Henrietta knows that Tennyson and Hattie are her last hopes. They're children now, but one day they might marry rich men who could save Aigredoux and the Fontaine family. 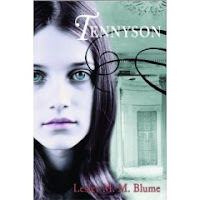 When Tennyson starts having dreams that tell her the true story of Aigredoux's past, she gets her own idea about what might help. She knows she has to bring her mother back, she has to get her family back together. But will her idea work? And what secrets about Aigredoux's tainted past will be revealed in her dreams? This is an unusual story about an unusual family. It's very gothic and the house and characters are suitably creepy. The mechanism of Tennyson's dreaming about Aigredoux works for the story because Aigredoux is almost like another character. It makes sense that it would communicate with Tennyson about its history. The book is set in 1932 and Tennyson's dreams take her back to the Civil War, but the house seems almost frozen in time. People from the same family still live there, using many of the same objects. My one criticism is that the ending really snuck up on me and I felt that it was very abrupt. Prepare yourself for that and I think you'll really enjoy this creepy, romantic tale of the American South. You can find more reviews by Little Willow and Sarah Miller. And yes, Lesley M.M. Blume is the author of 2009 Caudill nominee Cornelia and the Audacious Escapades of the Somerset Sisters and The Rising Star of Rusty Nail (which I quite liked but didn't review for some reason...).